For some of us, it’s hard to get motivated to organize even before budgeting in the cost of the project. 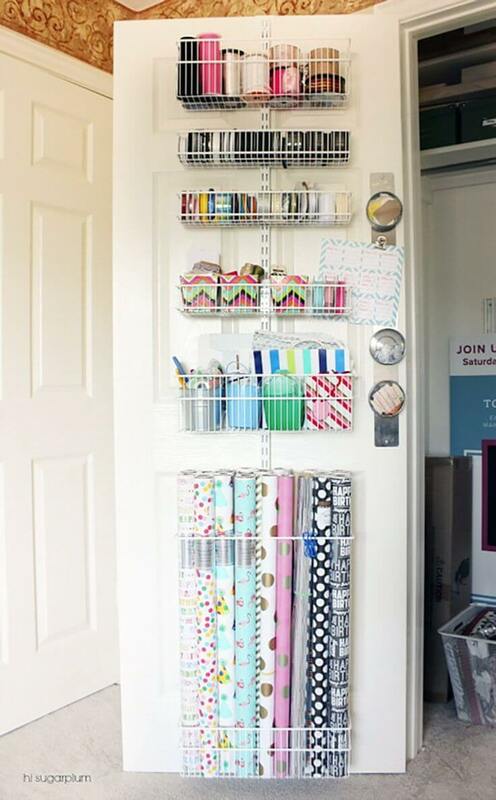 Fortunately, we’ve got lots of cool dollar store organization ideas that won’t break your bank. Best of all, some of them are so simple, easy and attractive that you might actually enjoy doing them. If you’ve got cans falling off your shelves and can never find the right kitchen utensil, then you’ll love our kitchen organizing ideas. On the other hand, maybe your weak spot is the bathroom. Tired of digging through your makeup drawer? 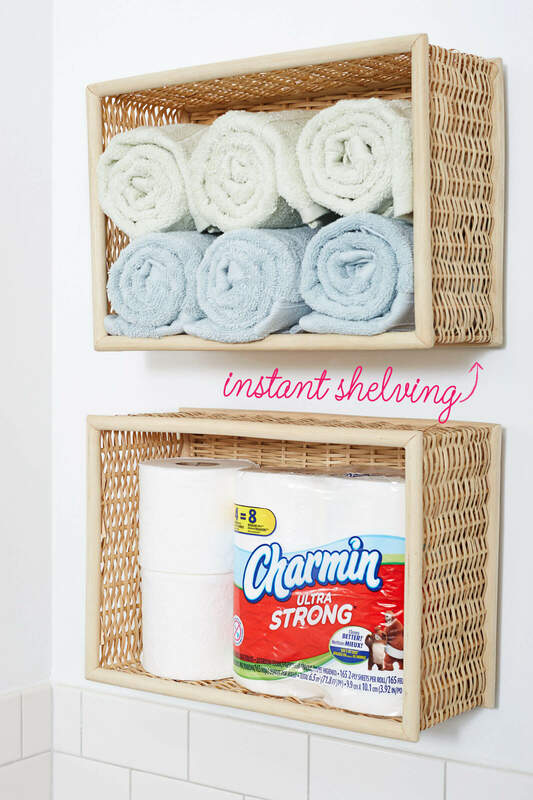 Want an easy way to keep clean towels off the floor when you don’t have closet space? We’ve got some great ideas for your powder room, too. They say cleanliness is next to godliness. You’ll definitely feel like a Martha Stewart level domestic goddess after applying some of these fun organizational ideas. You can find everything you need to tidy up your space at the dollar store, so there’s no reason to put it off any longer. Roll up your sleeves, tie on your head scarf, and get ready to free up some shelf space and unveil your better, more organized self. Do you have a limited cabinet or shelf space in your kitchen? 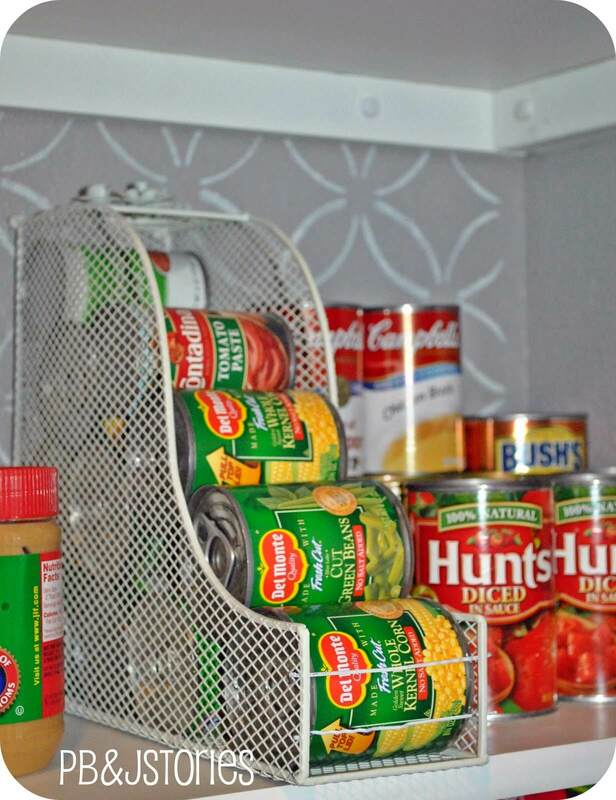 Try using a pyramid can dispenser to store canned goods. Because of its sturdy wire construction and compact design, this easily accessible holder keeps clutter off the counter and clears valuable shelf space, and its simple style adds some cottage chic flair while remaining functional. 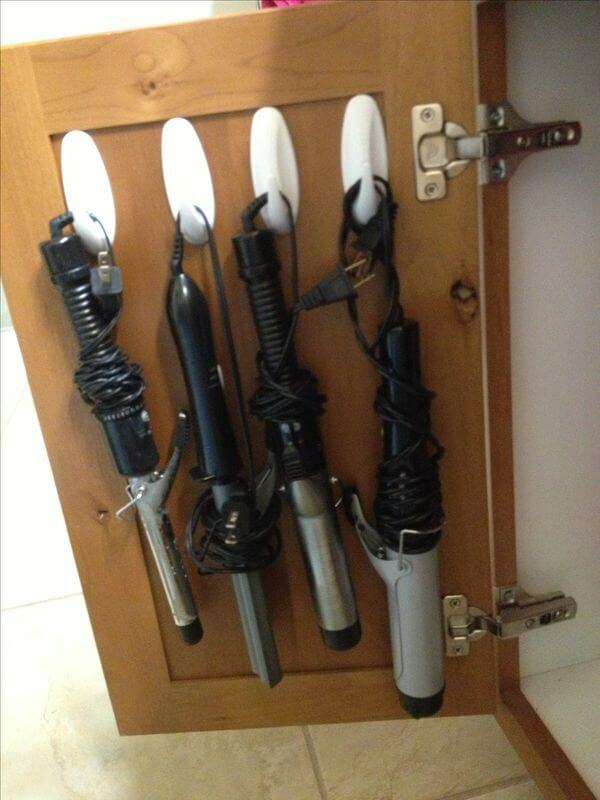 Hair styling tools are tough to store in small bathroom cabinets, but that doesn’t mean you have to give up your favorite curling iron. Simply attach some adhesive hooks to the inside of a bathroom cabinet, and hang your tools by their cords. This system may save you a few extra minutes in the morning by keeping your tools easily accessible. Those wicker baskets are not just for countertops. Try mounting them to a bathroom wall above the sink or near the bathtub. These baskets can store anything from towels to toiletries and keep useful items within arm’s reach. The wicker styling adds a casual style element that is reminiscent of the beach or cottage chic, and the color can be changed with paint as needed. 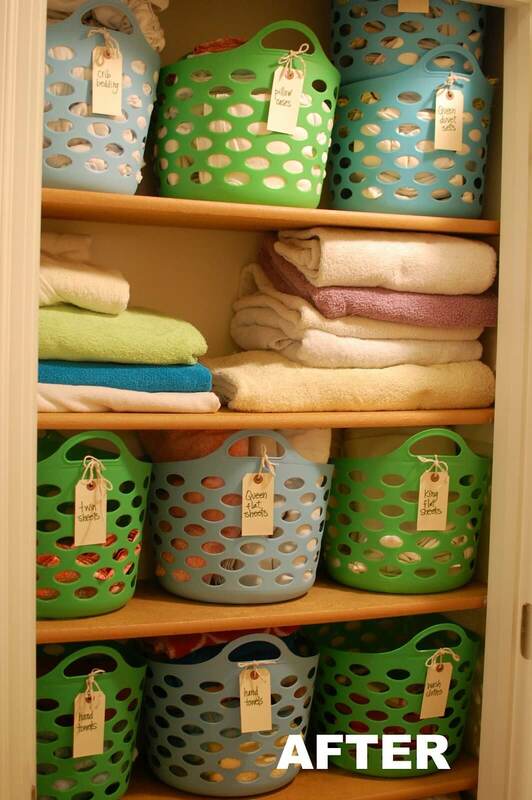 To keep your closets organized but still looking cute, try using the Dollar Store labels and baskets. The baskets keep everything in its place, and the labels make finding items easy. For an extra decorative touch, tie the label strings in small bows. They add some country flair to an otherwise humdrum closet space. A concentric vertical pan stacking rack can be a true space saver for anyone with very little storage room in the kitchen. 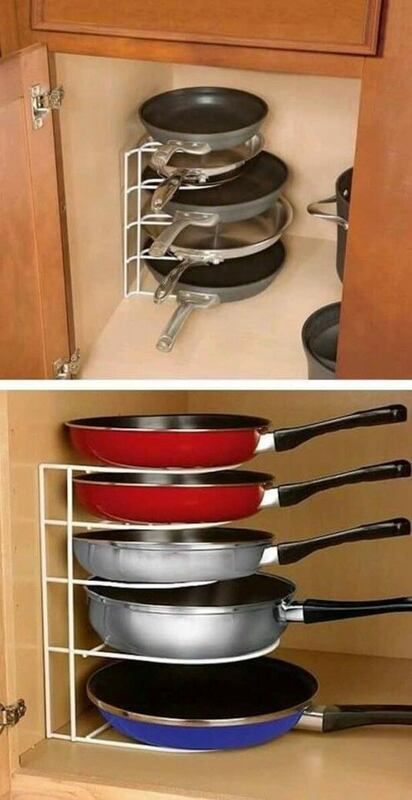 The rack makes stacking pans by size and shapes easy, and it prevents damage that may occur when stacking pans on top of each other. By keeping the pans stacked in order of size, they can be easily identified and accessed with very little noise or be rummaging. 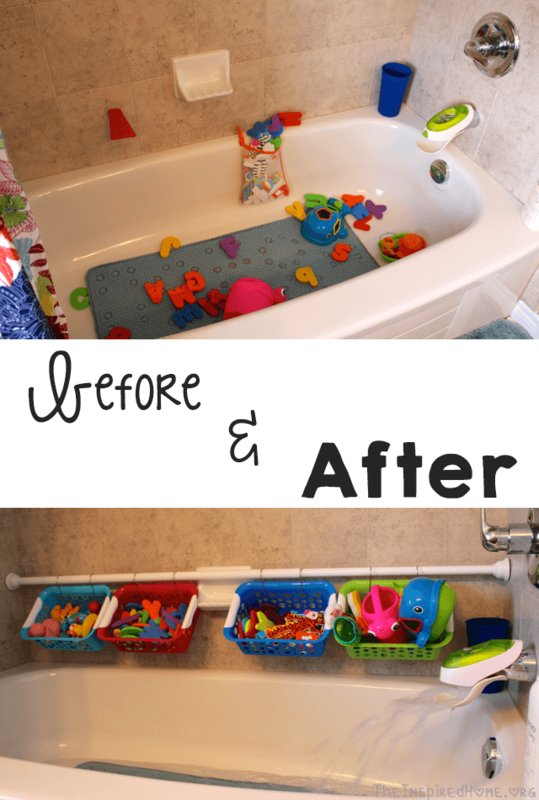 If bath time doubles as play time in your house, this bath toy organizer is for you. 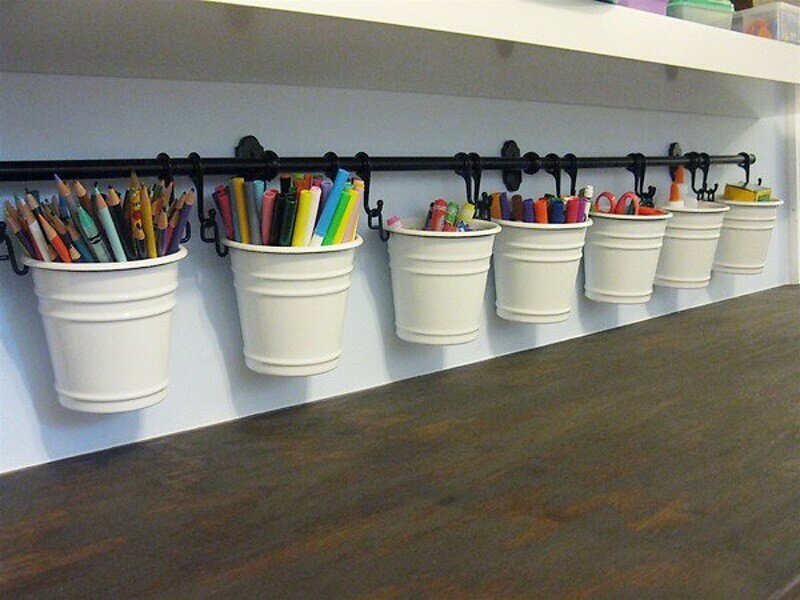 Hang brightly colored storage baskets from an expandable shower rod. Not only is this solution easy and useful, it is non-permanent and doesn’t require any hammering or extensive renovation. It’s also easy to use for little ones. Whether you have limited cabinet space in your kitchen, or whether you simply want a more convenient location for sandwich bags, pinning a sandwich bag to the wall with a clear thumbtack can make life easier. Also, pinning an empty sandwich bag box to the wall is a super easy way to recycle, and it makes for convenient storage of small items. 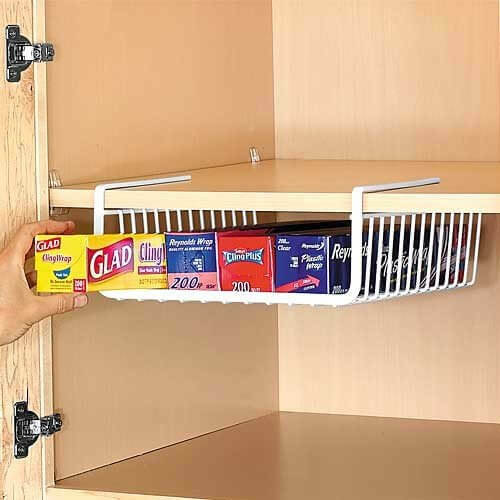 Make the most of your small cabinets by trying this under-shelf organizer. It can hold several boxes of wrap and paper materials, and its open design makes it easy to see what you’re grabbing. Also, if you want to avoid damaging your cabinet shelves, it easily attaches to the shelf with no nails, glue, or extra tools needed. 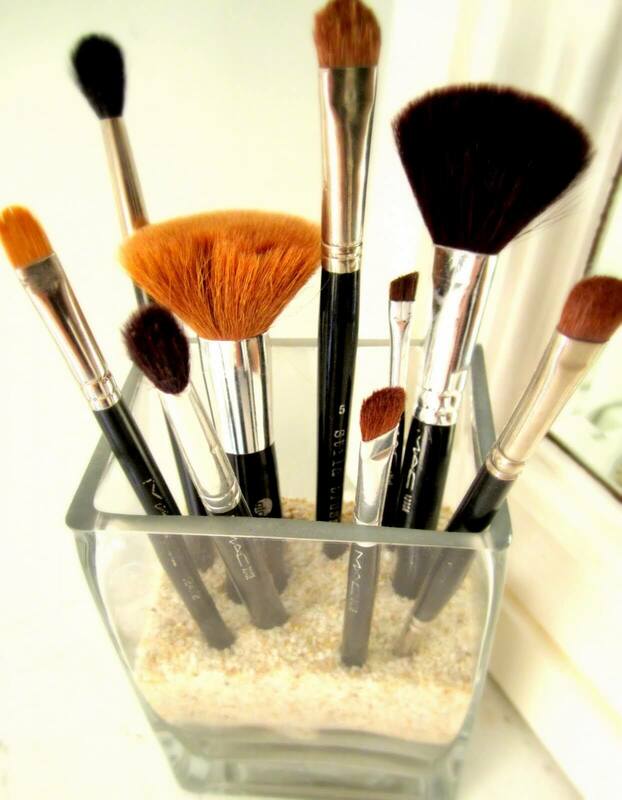 Storing several makeup brushes can be difficult, but here is a cheap and elegant way to do it. Use a decorative votive candle holder and pour some sand in the bottom. The sand will weight the glass and keep your brush handles in place, while the glass holder provides some flair to what might otherwise be a utilitarian storage solution. Minimalist and practical, this wire linen holder provides style and usefulness. Because it is lightweight, it makes carrying linens from room to room a cinch, and its rustic appearance against soft linens can complement any decor. Displaying bed linens in this item can make a room feel homey but stylish. 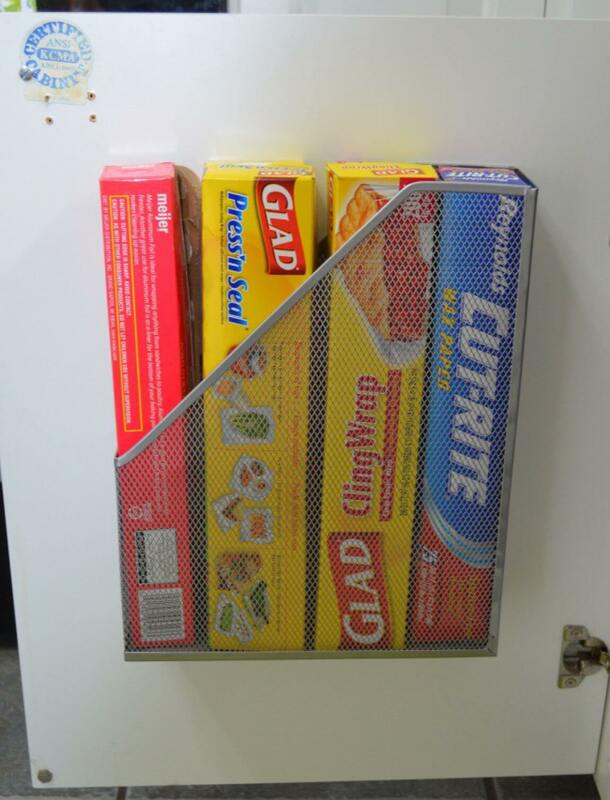 Attaching this aluminum foil and cling wrap holder to the inside of a kitchen cabinet effectively provides another shelf for kitchen necessities. Since it is on the door, it frees up actual shelf space within a cabinet and keeps things looking neat and organized. Its geometric lines complement the shape of the cabinet door. 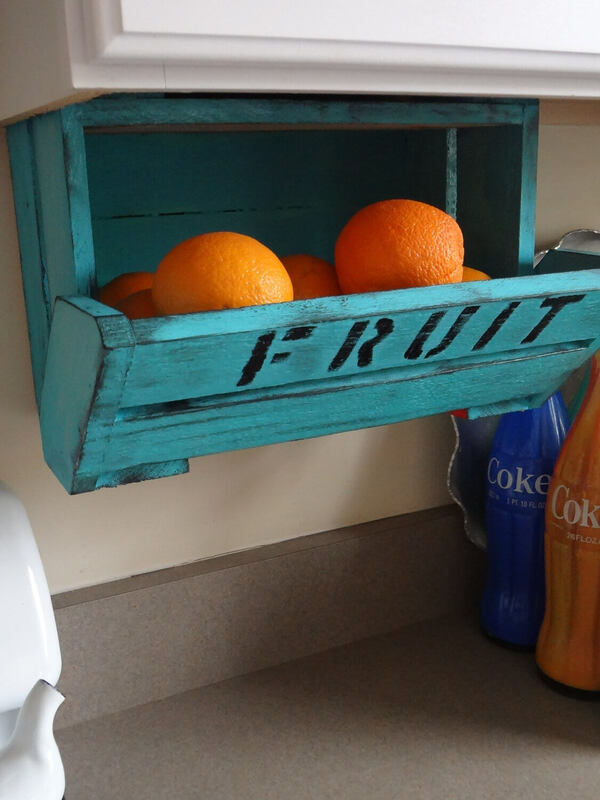 This fresh fruit crate not only provides a unique style element to a kitchen, it also functions as an extra basket. It can also cure a crowded countertop by keeping food items up out of the way. The colorful design and stenciled lettering can add some rustic style and brighten up an otherwise white or bland kitchen. 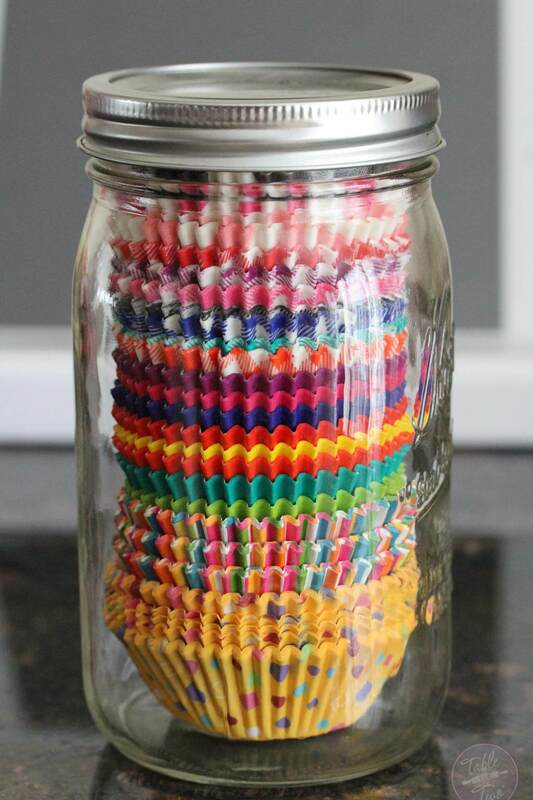 Use a mason jar to store fun, brightly-colored objects like leftover cupcake liners. A glass jar can bring a touch of the country, and the colorful cupcake liners are kept in one easily accessible place. Not only is it practical, but this easy storage solution can add some dimension to any countertop or table. The jars can also be lined up on top of cabinetry for out of the way storage. Instead of using drawers or closets to store an endless number of crayons and craft supplies, try this do it yourself storage method. Mount a curtain rod above a desk or inside a playroom, hang plastic flower pots from the curtain hooks and place supplies inside. This solution offers some geometric interest to what might be a chaotic area. If crafting is one of your hobbies and you have a lot of ribbons, try using a laundry basket to organize several spools of ribbon. Simply line up the ribbon spools, place a dowel rod through the middle, and allow each ribbon to have its own exit hole in the side of the basket. 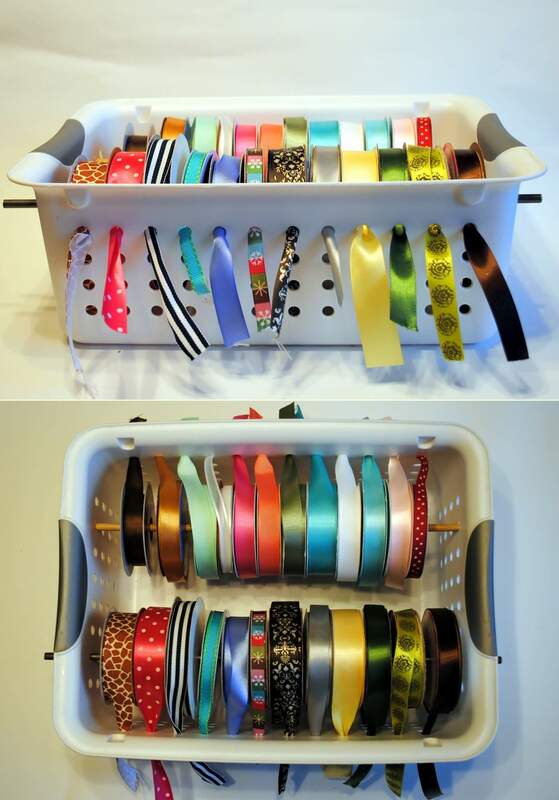 This can make storing and using each type of ribbon easy. Instead of struggling with trash bag containers kept in inconvenient cabinets, try wall-mounting a roll of trash bags for quick access. The small brackets hold a dowel rod which can be slipped through the bag roll. Also, use contrasting bag colors in order to add visual interest to a bare wall. The black and white bags and silver fixtures complement each other well. Create a peaceful and ordered area on your makeup counter by using this unique tip. 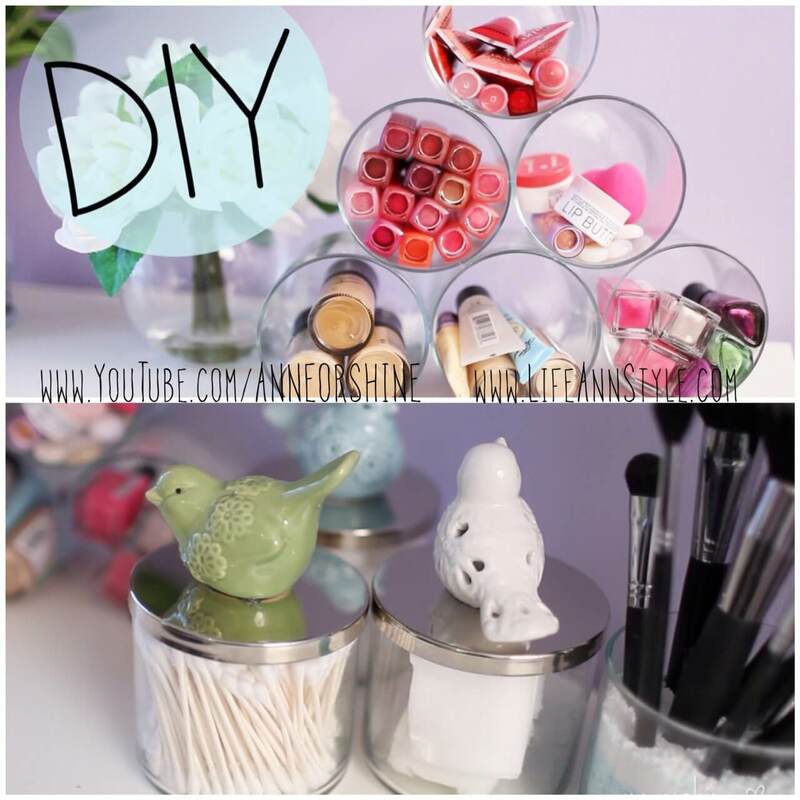 Fill a small glass globe with colorful rocks, and place your makeup brushes inside. The rocks will securely hold your brushes in place, and the appearance is simple and refined. Add other simple and elegant design touches, like flowers or a perfume tray. If your bureau is lacking personality, try using a stacked dessert tray to spice up the space. Not only will it offer tiers of storage space for small accessories like jewelry, hair ties, or perfumes, but it will add an elegant flair to the space. Use bright or unexpected colors to make a statement. This item can also be used in a bathroom to increase storage space on a small sink area. Make garden planters work overtime by using them to create beautiful and charming fruit baskets indoors. 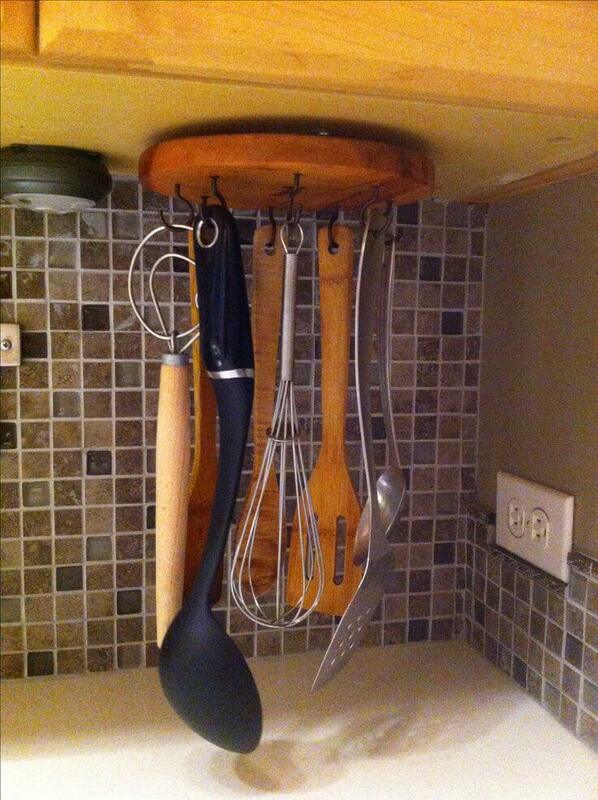 Mount them on a kitchen wall for maximum design impact. The wrought iron design is not only graceful but very sturdy, and it can offer a beautiful touch to a bare wall. Even when not in use these wall decorations can make a statement. 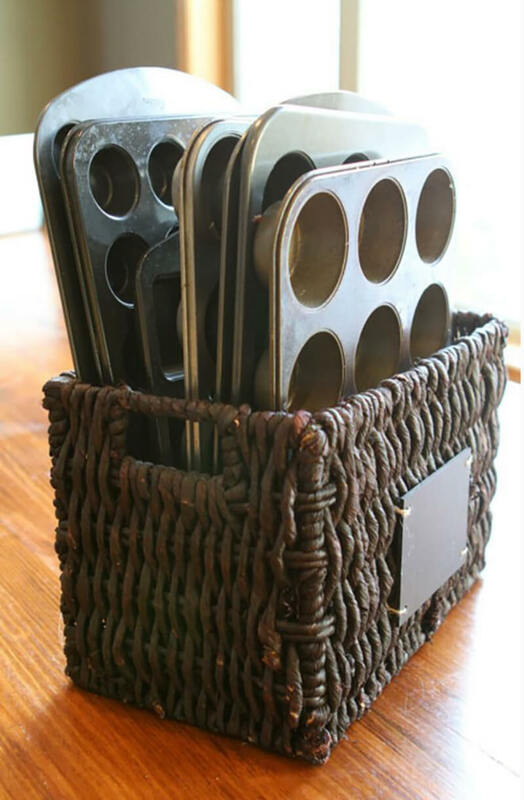 Eliminate the noisy clang of looking for muffin tins by storing them efficiently and elegantly in a rattan storage basket. The texture of the basket softens the more utilitarian metal of the tins and can be displayed in the open for easy access. The basket’s open wickerwork also allows for drying after a tin is washed and put away. Using metal hooks to hang utensils from is an inventive storage solution that eliminates the need for a holder or a shelf. By attaching a wooden disc to the bottom of a kitchen cabinet and inserting screw hooks into it, you can make finding the right utensil an easier and more visually interesting experience. 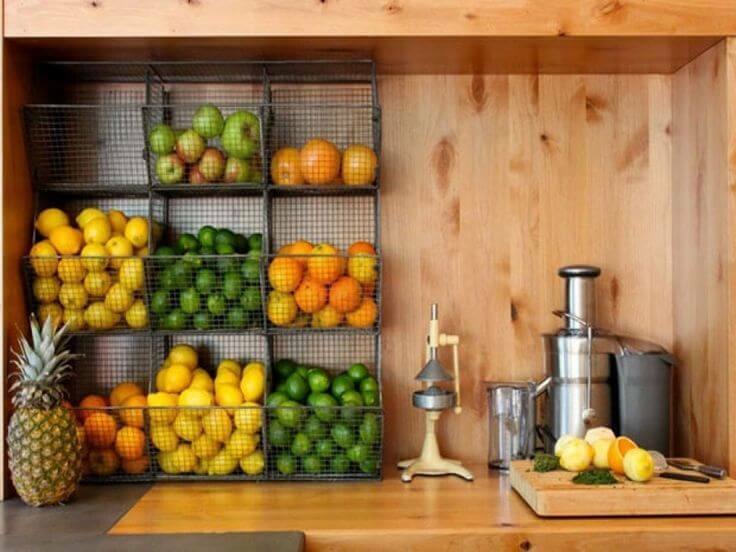 To keep a kitchen or bar area looking bright and organized, try creating a juicing station. A multi-level wire organizer keeps fruits separate and maximizes color impact, while small wooden and stainless steel appliances accent it. 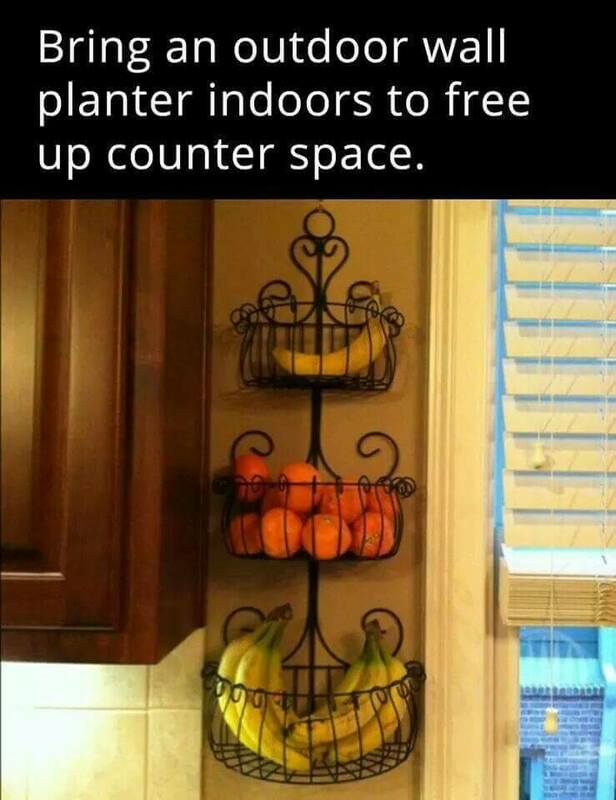 Organize fruit according to color or size. The wire organizer keeps things tidy while remaining easy to empty and fill. Get the most out of a drawer by using dollar store plastic containers to separate makeup and beauty products. 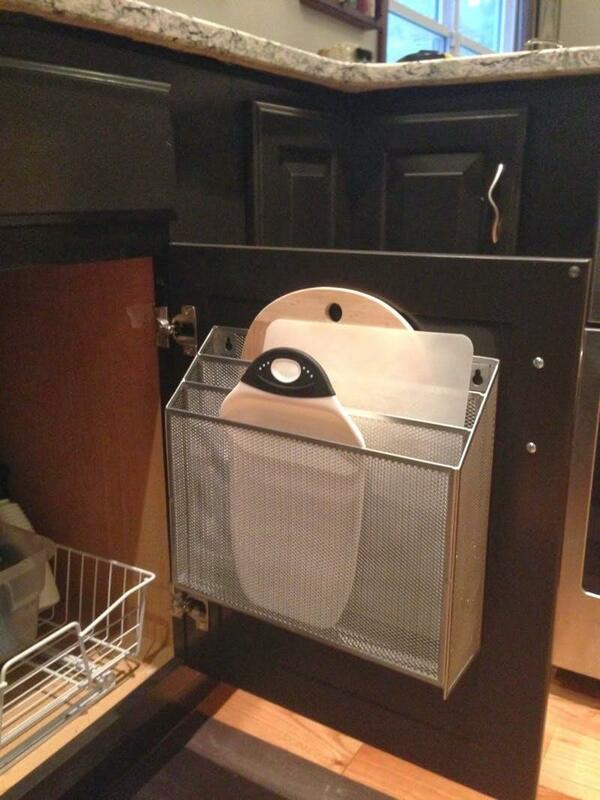 The simple, open bins allow for easy access, and this solution can keep countertops clear while keeping makeup tidy. 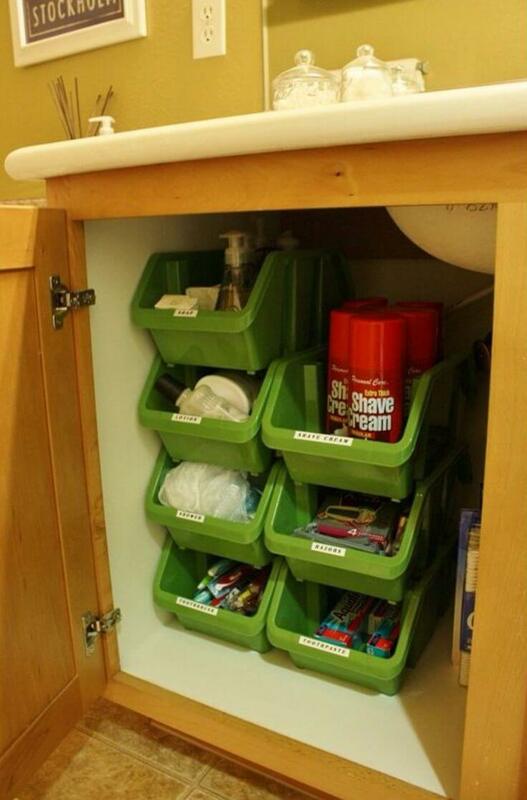 A rubber drawer liner is also helpful and keeps storage containers from sliding around. Use a shoe tree to store gift wrap and all the accompanying items like ribbon, bows, labels, and tape. The colorful ribbon and wrap will offset a white or bare wall or door, and the storage compartments will keep things separate and tidy. Prevent closets from becoming cluttered with old rolls of paper and bows by storing them with this device. A small closet does not have to limit your wardrobe. 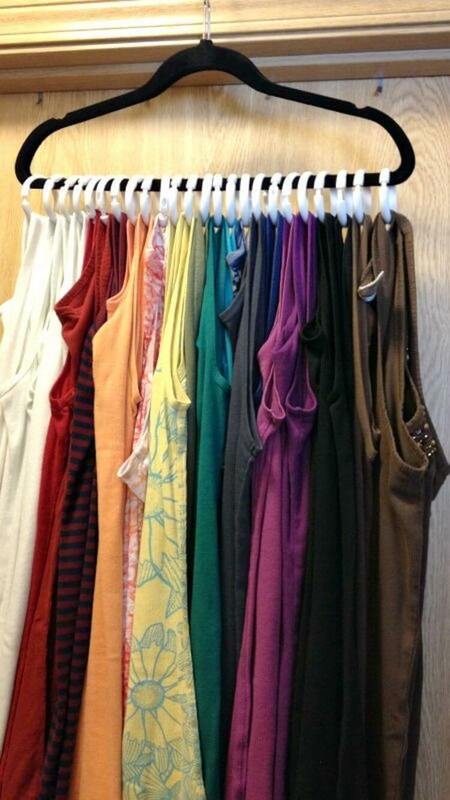 Store many tank tops on one hanger using shower curtain loops. For visual impact, order the shirts by color. Not only will this make getting dressed in the morning more efficient, but it creates a pleasing color gradation that gives the impression of tidiness. Make a statement by color-coordinating your “me time” bath and beauty supplies. 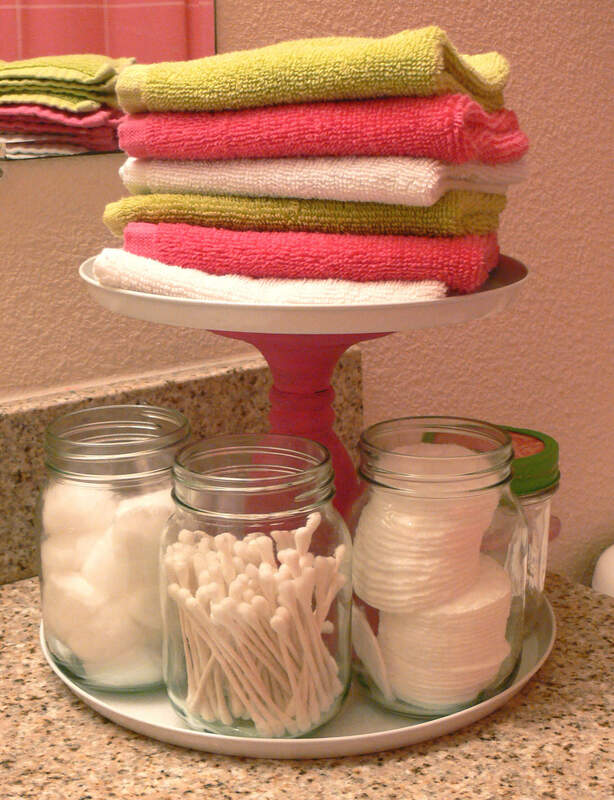 Get creative by using a colorful cake stand as a towel holder and mason jars as beauty holders. To finish with flair, stack hand towels in alternating or contrasting colors. This presentation makes pampering yourself a fun and functional. Practical bathroom items need practical storage solutions. Try nesting bins under the counter to keep things organized. The bins are sloped at the edges, making it easy to see what is in each container, and the fun color distracts from any dreary pipework under the sink. When not in use, these bins can collapse for compact storage. Keep your cutting boards cleverly stacked inside the door of a cabinet by mounting this multi-pocket wire container. Not only is the metal wire design clean and simple, it easily stores flat objects like cutting boards without cluttering a shelf or counter. Other flat kitchen items can be similarly stored within this container. 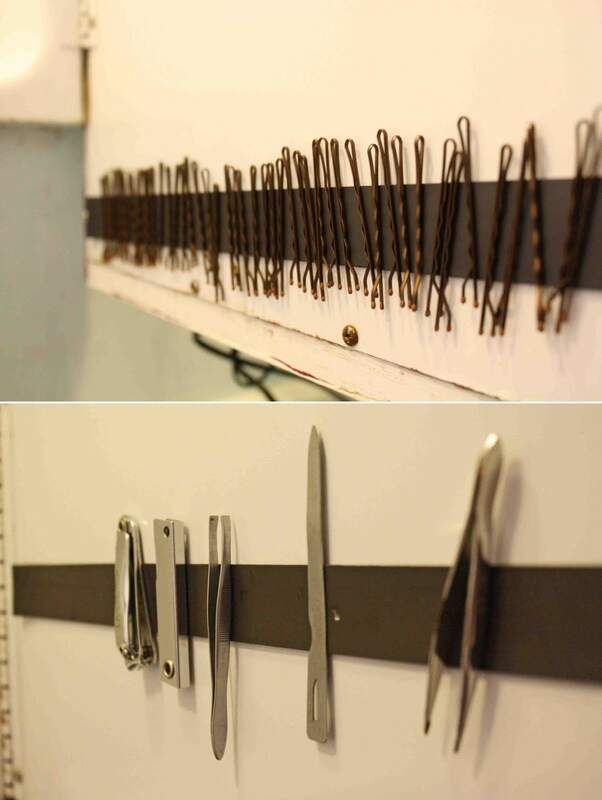 If your style is minimalist and quirky, try using a magnetic strip in the bathroom to keep track of small bathroom items like hairpins, clippers, and other grooming tools. This utilitarian look does double duty by adding visual interest while keeping things neat and tidy. 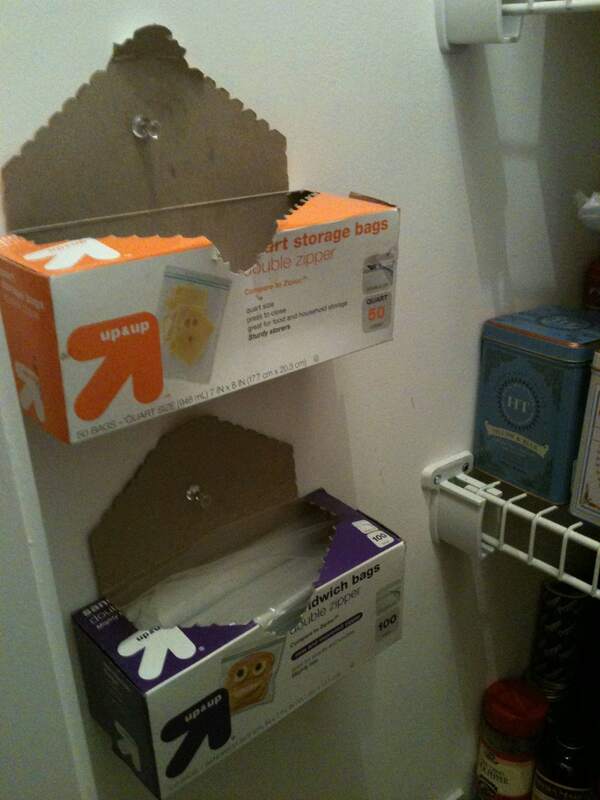 It can also save counter space by storing things in a surprising way. Both innovative and functional, a PVC pipe painted and decorated to match your style can offer a surprising way to store items like hair dryers or curling irons. Simply spray paint and apply extras like glitter to transform it from a common household object to a useful centerpiece for the bathroom sink. Using see-through linen caddies inside a closet makes finding things easy. 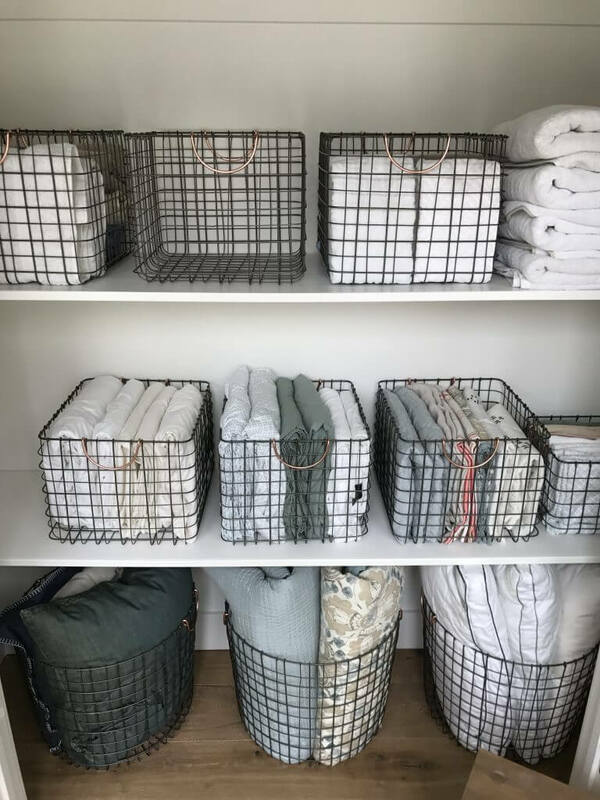 The wire texture of the caddies can punch up an otherwise boring closet, especially if linens are monochromatic or if the interior of the closet is flat white. These also make for easy carrying in case linens need to be transported from the closet to a distant bedroom. 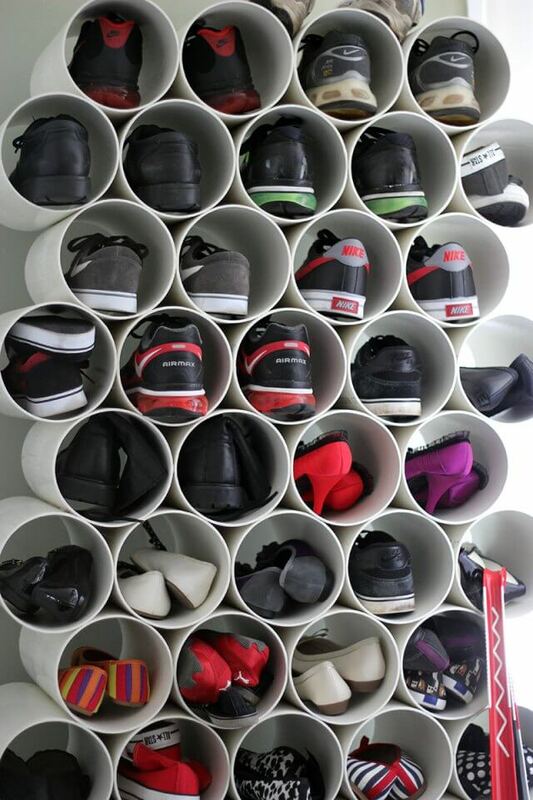 Add a striking design element to your bedroom by using PVC pipe to create a stacked shoe tree. This unique DIY project uses a repeating honeycomb-like effect to stylishly display a large or unruly shoe collection. Pipes can be glued onto one another in an alternating stack. Shoes may be arranged within each cell according to color or brand. Keep ugly cords and power strips away from feet and out of sight with this under-desk mounted storage basket. Using screw hooks to attach a wire basket to the underside of a desk, you can easily keep your wires from getting tangled or stepped-on. Best of all, it makes for quick access in case a device needs plugged or unplugged. Storing cleaning tools can get messy and cumbersome, and can take up a lot of unnecessary room. 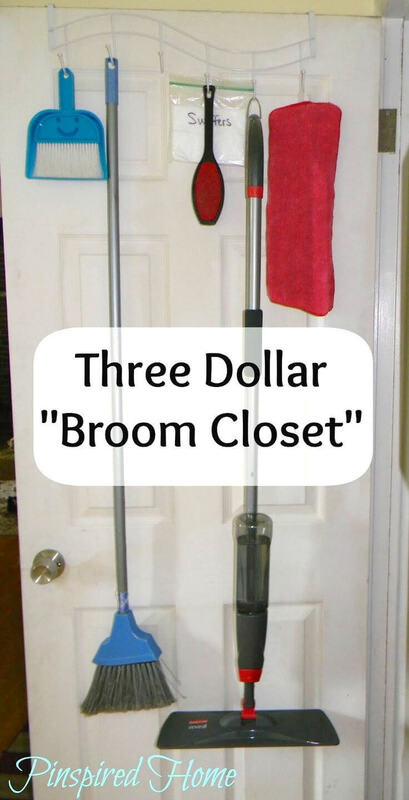 Using this in-the-door attachment can help keep brooms, mops, and other tools conveniently accessible while looking tidy. The wave design of this hook display adds a little extra design element for the area. Organize scarves efficiently and beautifully by using this hack. Hang each scarf on a colored shower ring, and then place the shower rings onto a single wooden hanger. Not only will this trick free up drawer space, but the scarves, combined with the shower rings, are so visually appealing that the hanger may be hung outside the closet if needed. Do your boots always flop over during storage? Try inserting foam pool tubes into your boots to keep them standing straight. In addition to being convenient, it can also extend the life of your boots by helping them to keep their proper shape in between wears. 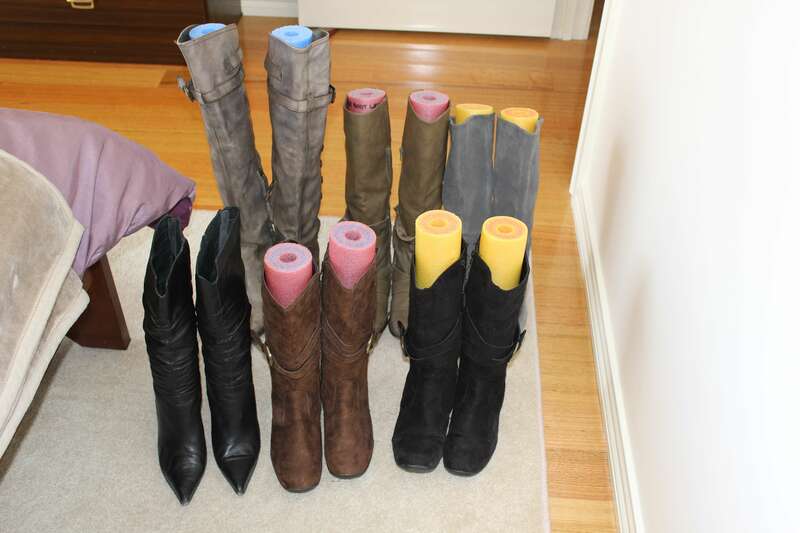 The colors of the foam tubes can also help you keep pairs of boots together. 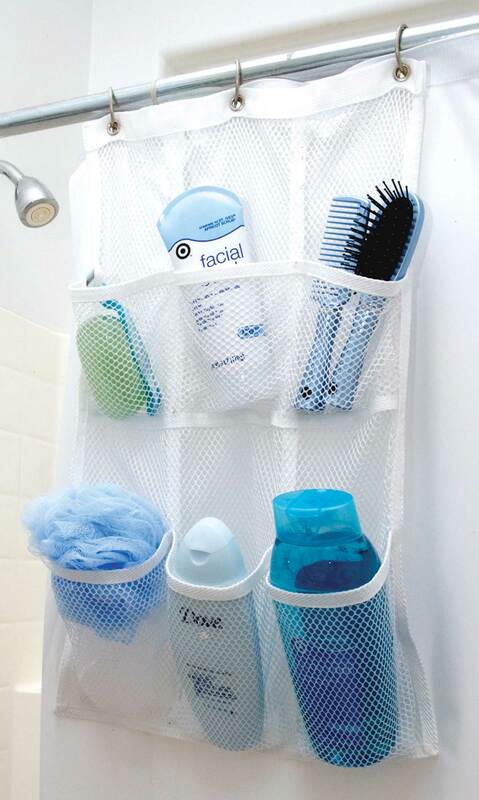 This mesh shower caddie is the answer for small bathtubs with little or no shelf space. Store all your bathtub items in its see-through and flexible pockets. For ultimate convenience, it hangs from the shower rod and can move as needed. Match the color to your shower liner, and you will have a great, unobtrusive accessory for the shower. 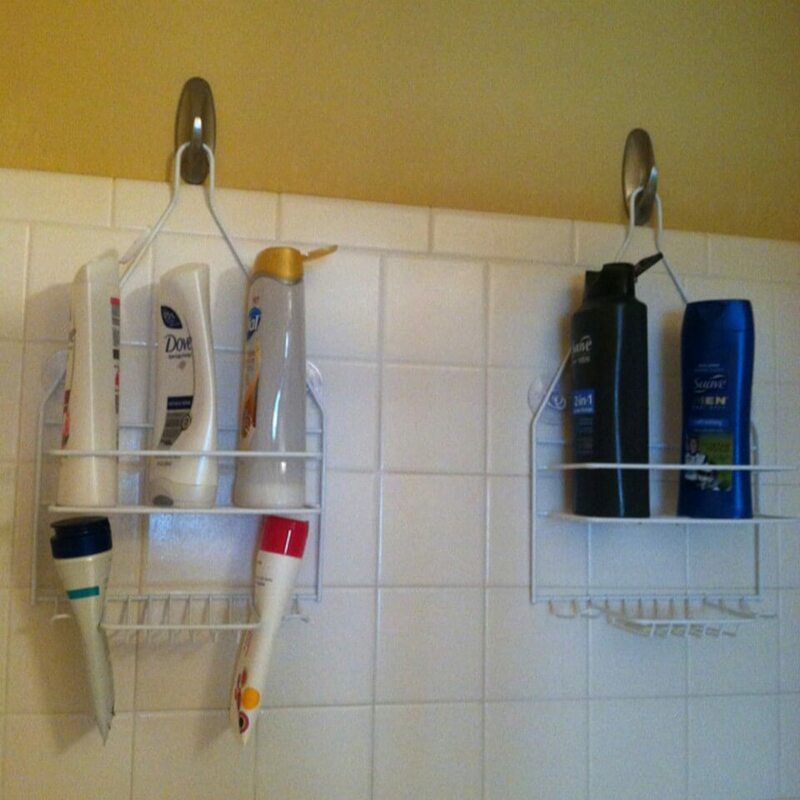 Using adhesive hooks and wire shelving, create this easy his-and-hers shower set. To make sure each storage shelf doesn’t announce itself too loudly, use hooks and wire shelves match the color of the tile of the bathtub. Keeping items separate can make showering more efficient, and it adds a charming touch to the tub. 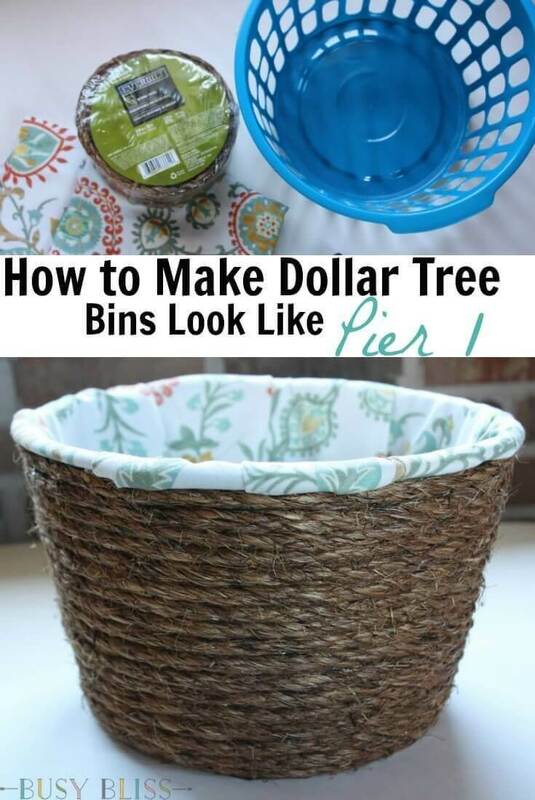 Dress up a plain plastic bin by weaving rustic rope in and out of the holes in one continuous motion. Tie off each end on the inside of the basket, and glue some decorative fabric inside to finish. 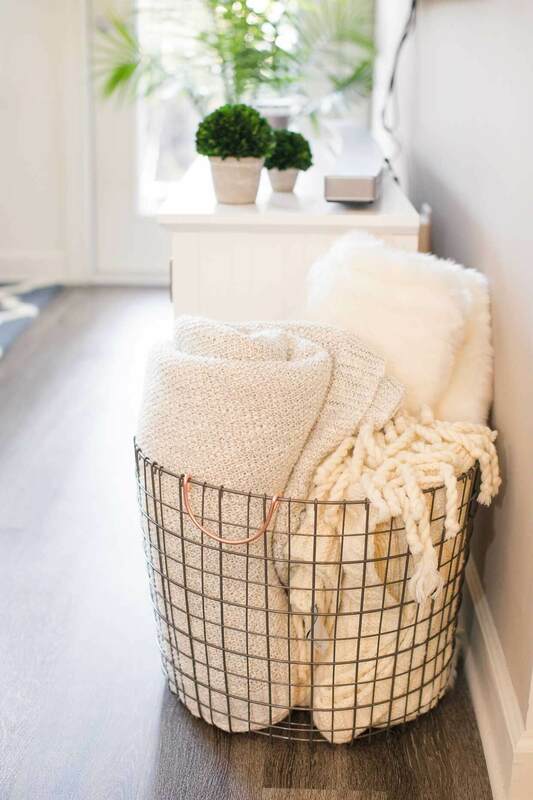 This can be a money-saving method of upscaling a laundry basket or small storage container and can add interest to a room. To keep mail organized, try using small wire caddies as holders. Mount them to a wall just inside a door for maximum convenience, and add labels to give them a polished, finished look. Use darker caddies on lighter walls and lighter caddies on darker walls to add visual impact, or add several to one wall to keep multiple items separate. 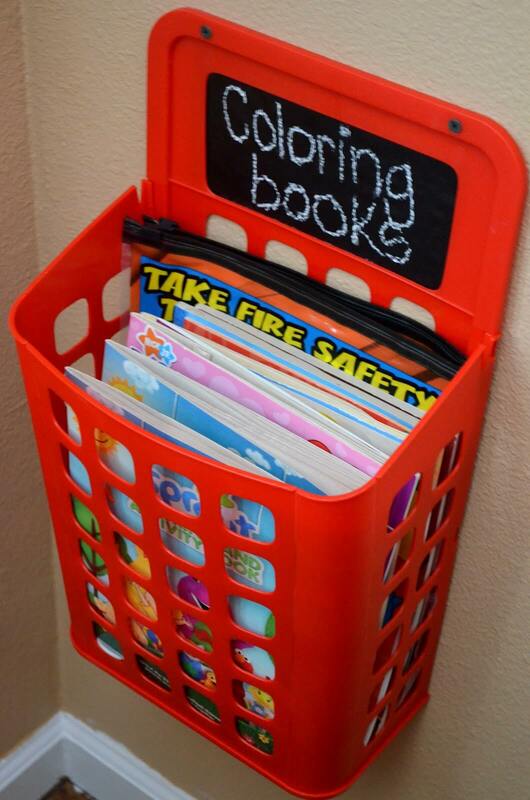 Use a colorful storage bin mounted to a wall to keep coloring books tidy. A large label can be added for easy identification, and to add appeal for kids, use chalkboard paint. If mounted to a wall this container can free up counter and floor space, and can also make tidying up fun for little ones. The see-through holes also add visual interest. 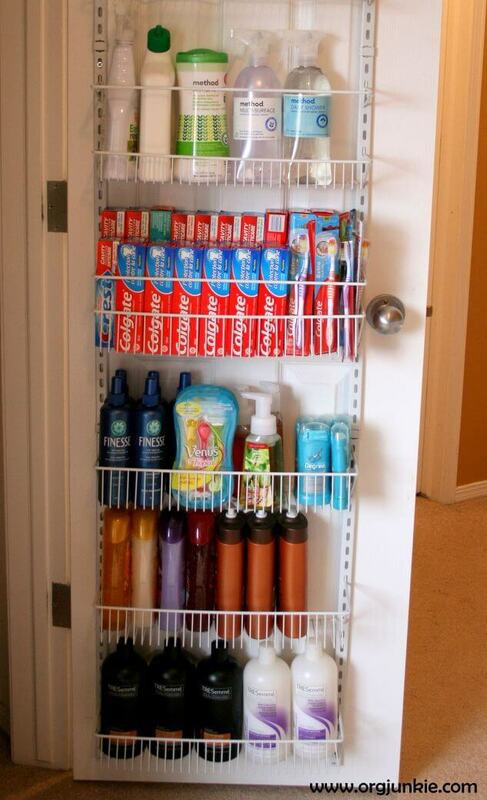 If you participate in extreme couponing, then you buy in bulk, which can make storage an issue. However, add to your bathroom space needs by adding a feature inside a door. Attach two sturdy metal brackets that run the length of the door. 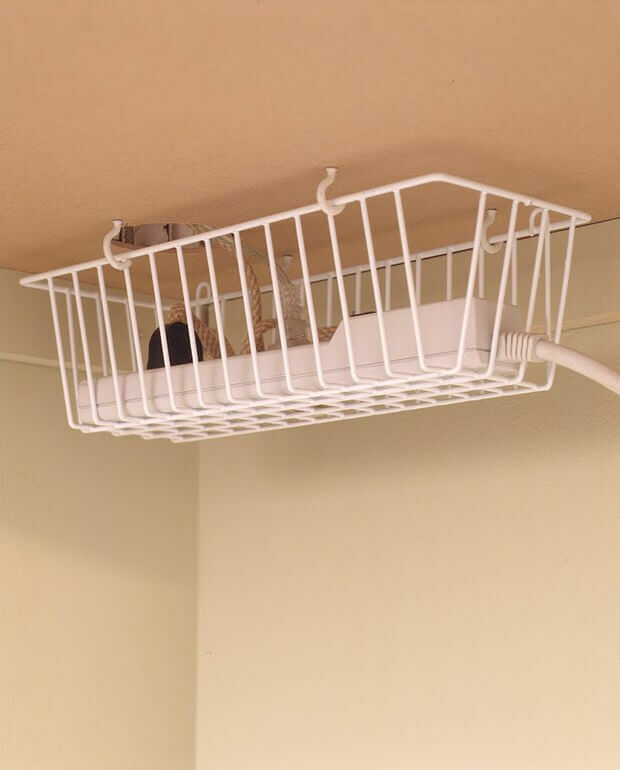 Wire containers can be hung at any level necessary, and several small items can be stowed away until needed. Cords and wires can get out of hand, but using toilet paper rolls to keep them separate can fix that problem. 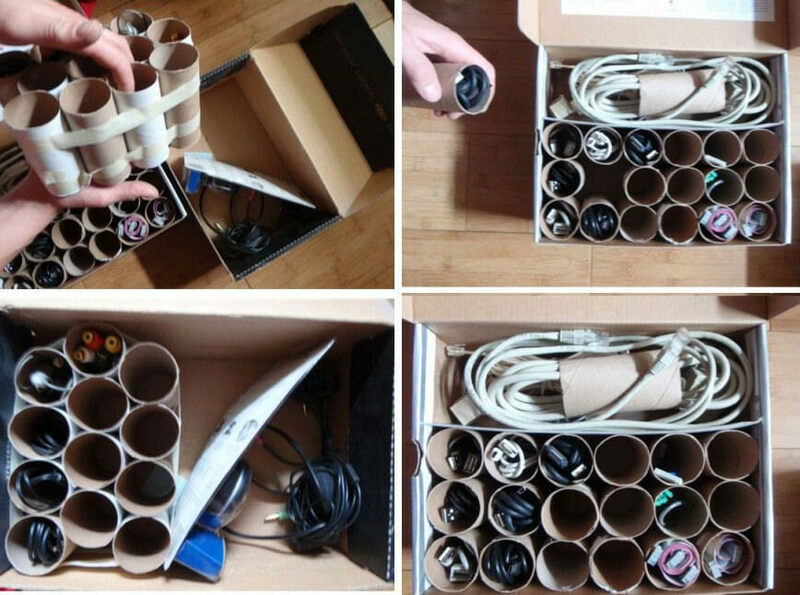 Tape several cardboard rolls together and place them upright inside a shoe box. Then place each cord in a separate compartment to keep things tidy. Not only is this a helpful tool, but the geometric effect of the rolls looks great. Keep lip products organized in a fashionable manner with this unique project. Tip small glass votive holders on their side with all the open ends facing one way, stack them in a pyramid shape and glue them together. The distinctive design will add some flair to your makeup area, and the names of lip products may be more visible. 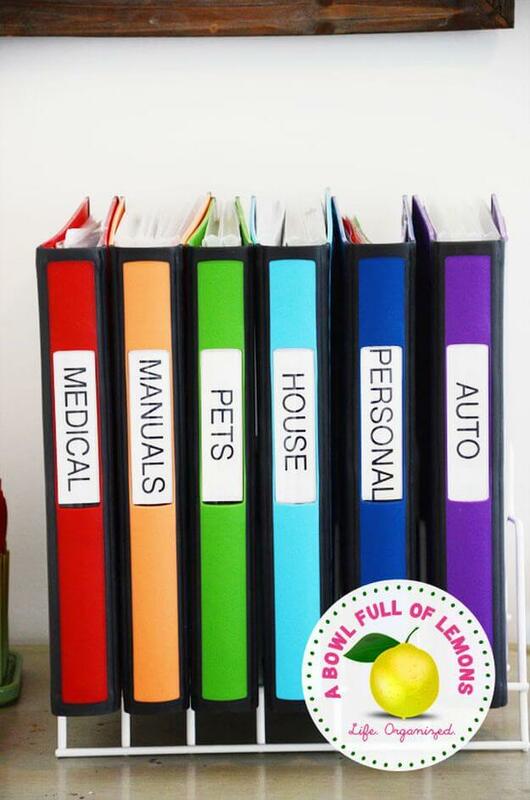 Add a pop of color to your workspace by using color-coordinated three-ring binders to keep paperwork organized. Use labels on the spines so you know exactly what is inside each binder, and set them on a wire rack for a clean and tidy look. The color coding can also aid in keeping them in order, and the wire rack makes for easy transportation if needed. Sweeten up your craft area by using large candy jars to separate and tidy brightly-colored supplies. 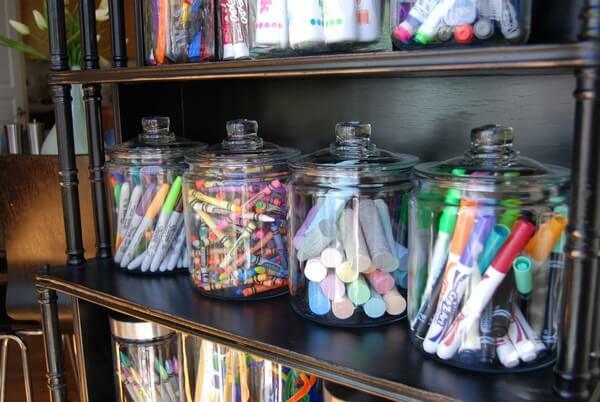 The clear glass offers quick visual identification of where items are stored, and the cute style of the jars cleverly shows off crayons, chalk, or markers. The lids make for easy access, and the size of the jars offset any craft clutter. 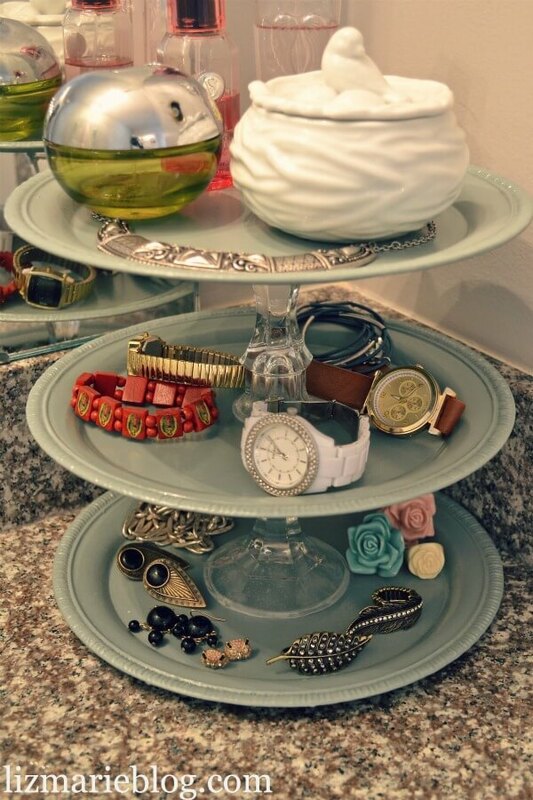 Instead of hiding your jewelry or accessories, make them part of the decor. 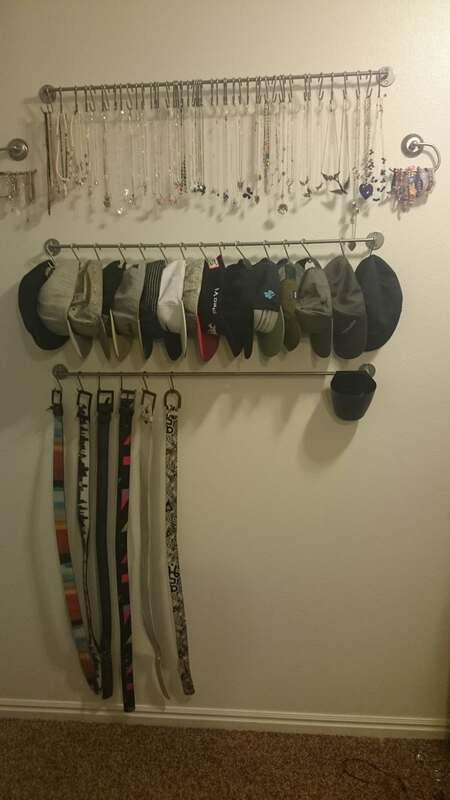 Using utilitarian metal rods that are mounted on a wall, S-hooks secure hats, belts, necklaces, and other small items. These rods keep order while making a dramatic style statement, and keeping everything straight and evenly spaced is important to pull off this look.